1. 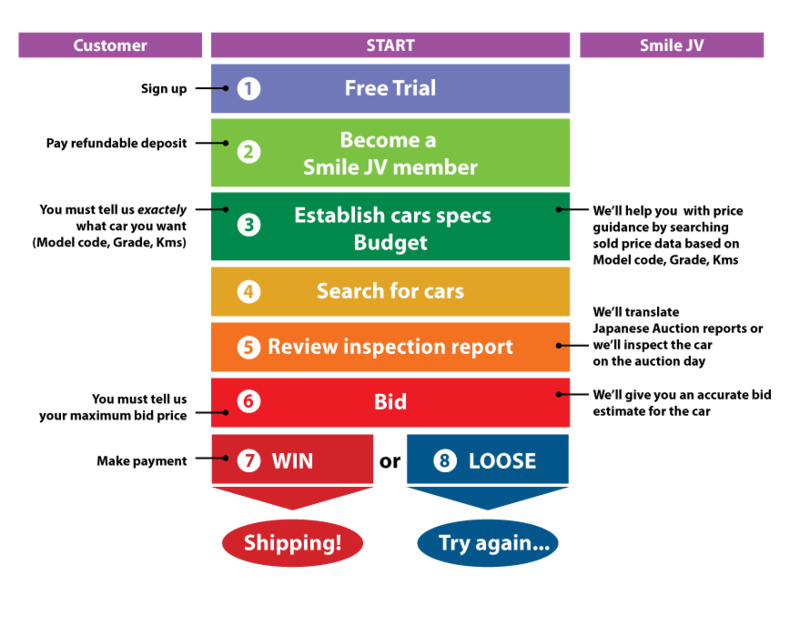 You can access the Japanese Used Cars Auction using Smile JV's free online auction website and search for a used car in Japan. This is a free service, however if you ask us we will upgrade your account to full Smile JV Membership status for a free trial. This means you gave greater access to search sold prices data (very handy to get a genuine idea of car prices in Japan!). Log in here. 2. Before you place bids in the Japanese Auction System, we request a down payment as security... if we didn't have this I'm sure you can imagine how many people would never pay. This payment is refundable at anytime before you win a bid, and buy a car from one of the auctions in Japan. Once you have done this you become a full Smile JV member with unlimited access to all auction data, and can place bids. 3. The next point is most important if you would like us to help searching for a car - we need to know what you want! Prices in the auctions for cars of the same year/make/model can vary by a HUGE amount depending on things like mileage (Kms), condition (Auctions Grade) and also the model (we use the model code). Things like leather interiors, sunroof, and colour can also effect the price. So we need to know in detail what you want otherwise It gets frustrating and time consuming for buyers (and for us). 4. Searching for the right car is the easy part. You can do this on your own via the Japanese Auction Database, or we can help you as well (if we know what to look for). 5. Once something interesing comes up that is suitable for your budget, we will translate and discuss the auction report with you. We will give you some guideance about the likely sell price based on the most recent sold price data. 6. You place bids via our auction system and we will bid up to your maximum amount (+/- 20,000 yen .. unless you tell us otherwise). So there are no misundertsandings, all bids must be in writing. If the car comes in lower than your maximum bid price, then you pay less and if it sells higher, then you don't get it. We give you full discolosure and access to see the actaul sold price (in other words we do not inflate this price). 7. After we recevie payment, we export your car and we will send you all necessary documents by postal mail. These documents inlcudes the Bill of Lading, Invoice and Export Certificate - see more about shipping here. NOTE: Please check your local laws and importing regulations before buying a car from Japan, and ensure you read our terms and conditions.